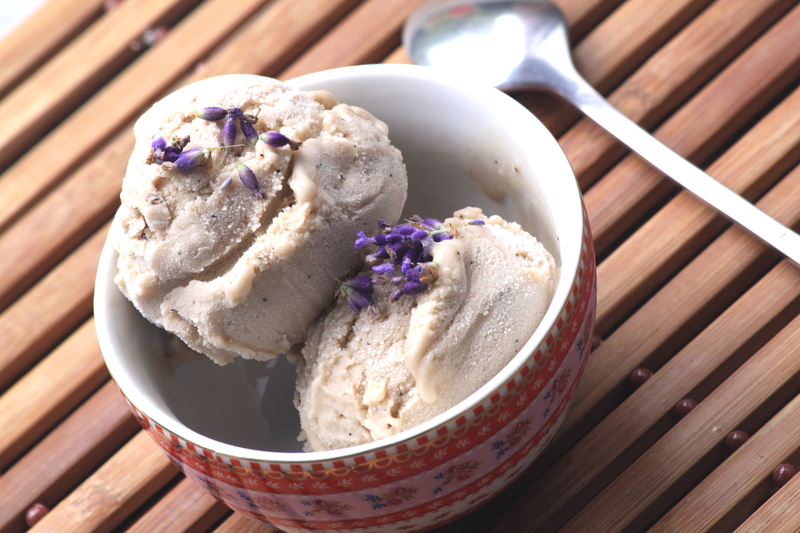 Banana ice creams are a major hit in any food blog. There are hundreds of ideas on how you can make easy, healthy and delicious ice creams using frozen ripe bananas. So this is one more version, for your collection. Bring all the ingredients together in a food processor and blend them until smooth. Leave it in the freezer for at least 3 hours. If you have an ice cream maker, even better. In that case, there is no need for bringing the blended mixture to the freezer. Remove from freezer and leave it at room temperature some 5 minutes before scooping the balls. Serve it with fresh lavender blossoms or lavender syrup. Variations: it works pretty well with other flowers, such as violets, elderflowers, camomile, linden, hawthorn... It also works great with Chai spices added to it. I like doing it in winter time.